Below are common attributes associated to Wintergreen Boxwood. Become a care taker for Wintergreen Boxwood! Below are member comments regarding how to plant Wintergreen Boxwood. No comments have been posted regarding how to plant Wintergreen Boxwood. Be the first! Do you know how to plant Wintergreen Boxwood? Below are member comments regarding how to prune Wintergreen Boxwood. No comments have been posted regarding how to prune Wintergreen Boxwood. Be the first! Do you know how to prune Wintergreen Boxwood? Below are member comments regarding how to fertilize Wintergreen Boxwood. No comments have been posted regarding how to fertilize Wintergreen Boxwood. Be the first! Do you know how to fertlize and water Wintergreen Boxwood? Below are member comments regarding how to deal with Wintergreen Boxwood's pests and problems. 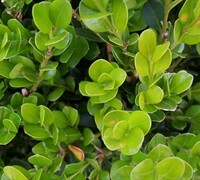 No comments have been posted regarding how to deal with Wintergreen Boxwood's pests and problems. Be the first! Do you know how to deal with pests and problems with Wintergreen Boxwood? Get Wintergreen Boxwood fresh and large directly from the grower to your garden! Buy Wintergreen Boxwood online from the nursery wholesalers and save BIG! Wintergreen boxwood performs best in sites that provide well-drained soil and full to mostly sun. Wintergreen boxwood will keep a nice rounded shape all on its own. However, if a more formal shape is desired, it responds very well to pruning or shearing. Cease pruning two months prior to typical first frost to avoid forcing a flush of new growth that could be damaged by cold weather. I fertilize boxwoods with a well-balanced shrub & tree type fertilizer in spring and again in late summer. If your boxwoods develop chlorosis (yellowing of foliage due to soil pH) you can apply a dose of chelated iron or soil sulphur to acidify soil and correct this problem. I've seen no serious pest or disease problems with Wintergreen boxwood. It is more cold hardy than Japanese boxwood and less prone to disease problems than the American boxwood. Consistently wet soil can cause problems with the roots.